The sun's outer atmosphere, the corona, is wrapped by strong magnetic fields that trap the sun's plasma to its surface. At times, the magnetic field lines will snap and reconnect at other points on the sun's surface and the now-unbound plasma spews out into space as a coronal mass ejection, or CME. Large CMEs can contain a billion tons of matter and move several million miles per hour; comparatively, yesterday's CME was more of a dribble. 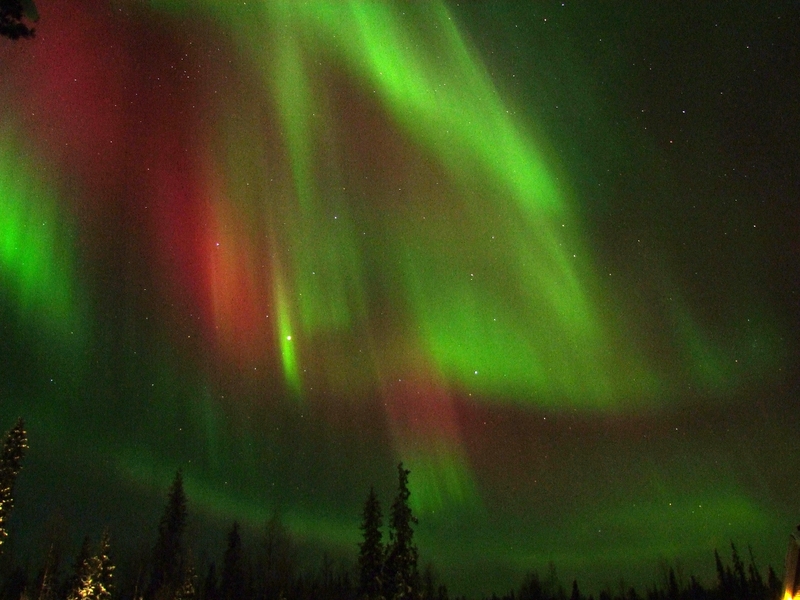 Earth-bound coronal mass ejections take about one to three days to arrive– sometimes, with quite spectacular effects. When coronal mass ejections reach the Earth's magnetic envelope, the magnetosphere, the magnetic field of the CME can warp the Earth's magnetosphere. While more intense CMEs can produce geomagnetic storms that interfere with satellite-based communication and electrical systems on Earth, the more common and more awesome mark are the bright auroras that appear near the poles. To get space weather alerts (like wunderground – for space!) go to the NOAA prediction center. Or read more about yesterday's CME here. For more, follow Quark Twain's tweets! Please check the dates presented as a caption under the magnificent photo of the aurora. 2013 should be 2012. The photo caption reads February 26, 2013.... From the world of tomorrow!!! A question: Can there be a magnetosphere without an associated electric current? And in reply "Well, they are the same thing, EM wave= electro-magnetic. But I see what you mean, you are asking it see linen unto can there be mass without atoms? Isn't that what DARK MATTER is? So I guess you question is more geared toward 'theoretical physics' I can't answer you question, but I hope I helped spark somebody's mind to get your answer.